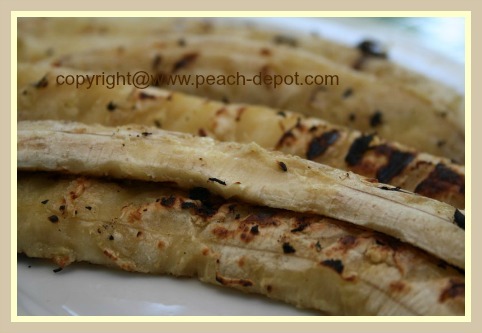 Have you ever considered Grilling Bananas? If so, here are easy to follow instructions for barbequing this popular fruit - it's an easy, quick and fun way to make a dessert finale to a supper around the grill! 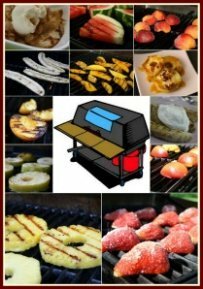 Try something different for your backyard barbeque ... everyone enjoys trying something unique, so why not make grilled bananas and wow your family and friends! 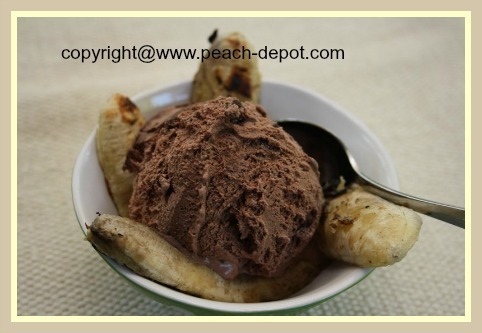 In most areas bananas are commonly available all throughout the bbq season, so why not buy some soon and try one of these recipes. 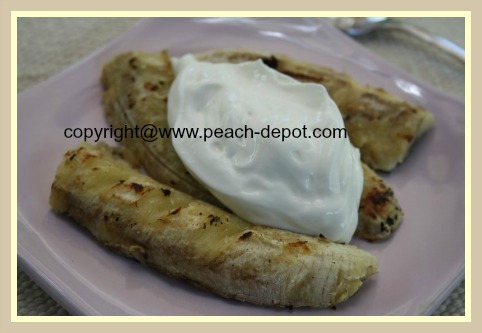 I like to serve the grilled bananas with ice cream or with yogurt, or with a dollop of whipped cream, sour cream or Greek Yogurt for a finale to a grilled dinner. Everyone will go BANANAS ;) over this Dessert! 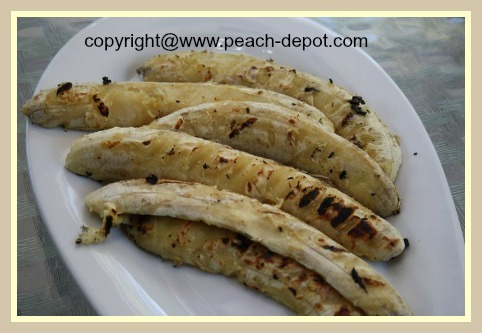 Scroll down for easy to make recipes for bananas on the grill. Prepare the grill for direct cooking over medium heat, (about 400° F, and ensure the grates are clean and oiled. 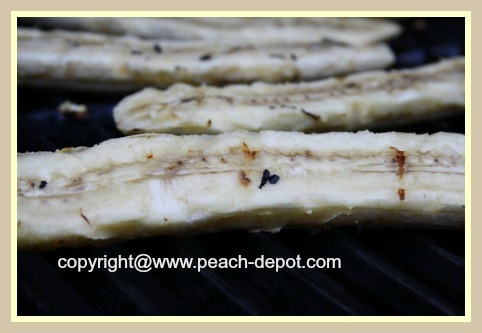 Slice the bananas in half lengthwise to prepare for grilling. 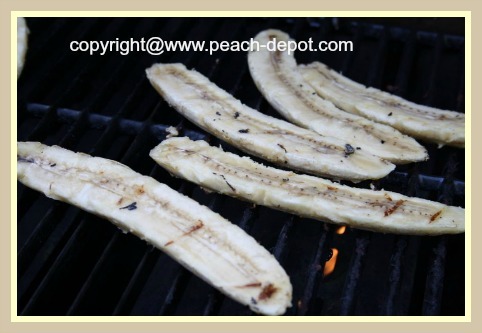 Grill the bananas over direct medium heat, with the barbeque lid open, until warm and well marked, but not too soft, about 3 - 4 minutes, or until grill marks begin to show. 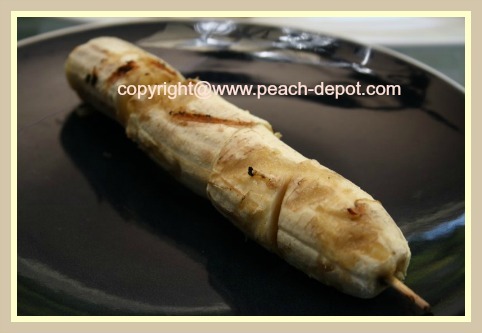 To make bananas skewers, slice bananas into about 3" long pieces, and grill for about 4 - 5 minutes, or until grill marks begin to show. Oil spray bottles similar to the one pictured below are a great aid when grilling fruit! They are also great for adding the oil of your choice to a green salad. 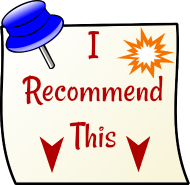 Click on the image below for more detailed product information and customer reviews. 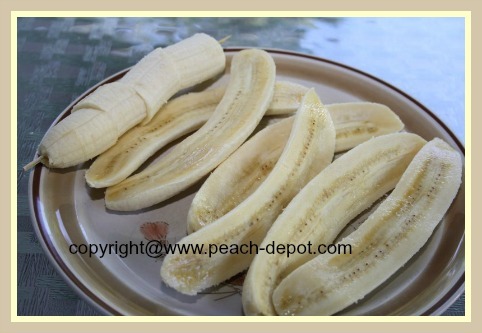 Cut the banana peel lengthwise about 1/2 inches deep, leaving 1/2 inch at both ends. Open the peel wider to form a pocket. Fill each of the pockets with 1 tsp. miniature chocolate chips and 1 tbsp. miniature marshmallows. Using 4 pieces of heavy-duty foil (about 12" square, each), crimp and shape the foil around the bananas, to make "boats". Grill, uncovered, over medium heat for about 10 minutes, or until the marshmallows are melted, and are golden brown. Makes 4 grilled banana desserts!